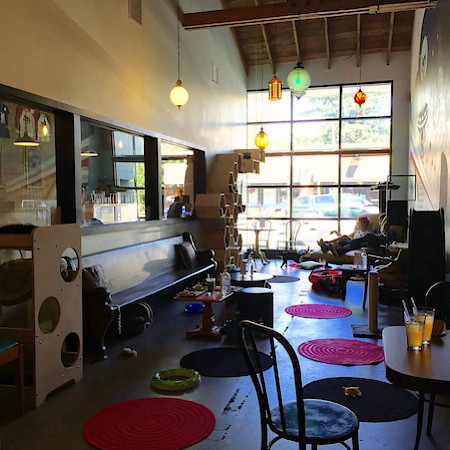 The cat cafe has come to the hip city of Portland, Oregon. 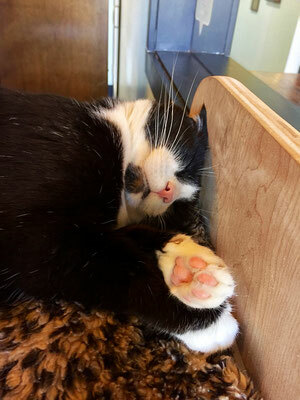 But this one isn't just any regular old cat cafe! 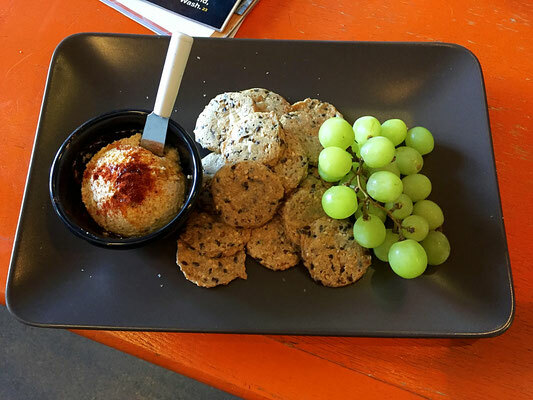 Purrington's has food, beer, cat yoga, movie nights, cool gifts, and much more! 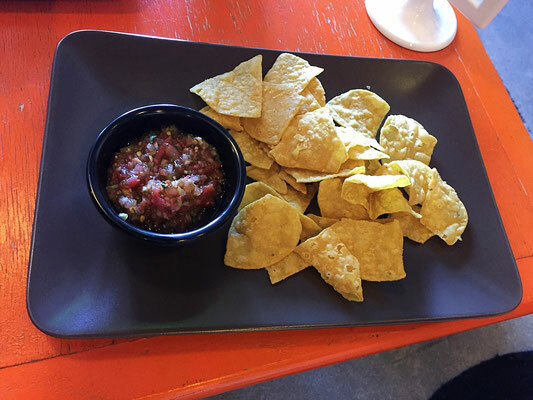 This article brought to you by Purrington's who provided complimentary food. Affiliate links included. See disclosure for more. When quirky Portland does anything, of course it has to be super cool. 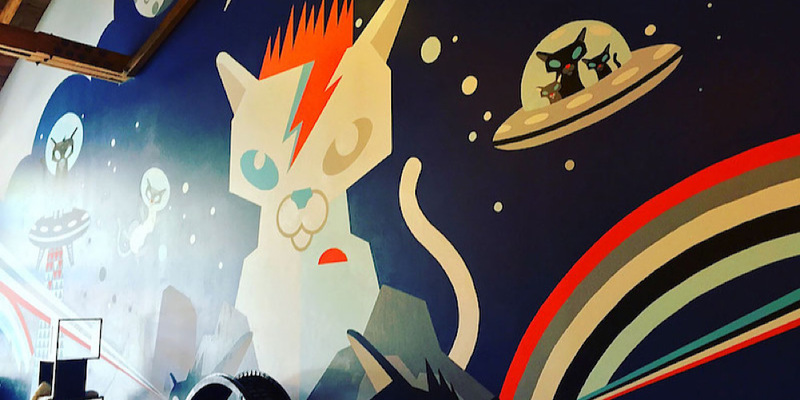 So (as if cats aren't cool enough) now we're talking local beer on draft, a wine selection, delicious house-made foods and treats, yoga classes, movie nights, reiki, a featured hip hop artist, t-shirts, gifts, and much, much more! They've thought of everything. 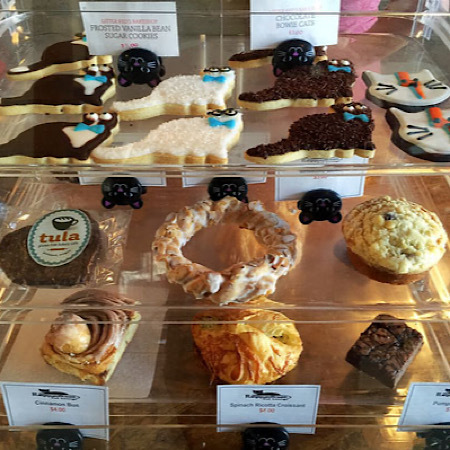 Purrington's has teamed up with local rescue organization Cat Adoption Team (CAT) to help further the cause of cat rescue and adoptions in Portland. About eight to ten lucky adoptable kitties come to live at the lounge and hang out as they please to mingle and mix and meet their potential forever families. The lounge is bright and inviting with a beautiful eclectic mix of furniture, lamps and artwork. It feels just like a cozy living room! In the lounge, the kitties get to play with tons of toys, furniture, a special spinning cat wheel, and have a separate potty room. They play when they want, sleep when they want, pretty much do anything they want. Because, hey, that's what cats do best. 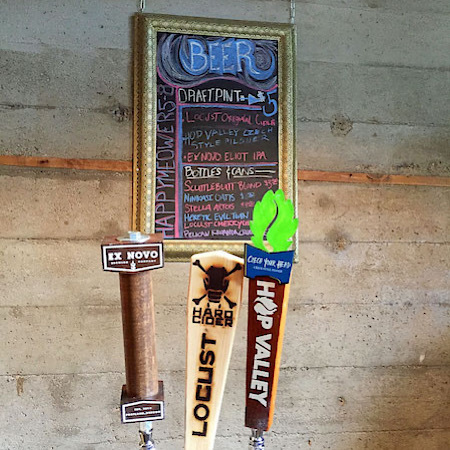 And since this is food and brew-centric Portland after all, there is a bar serving kombucha, beers, ciders, wines, teas and coffees. 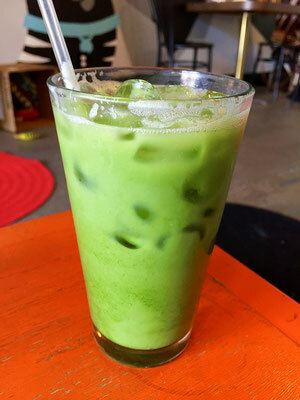 Try a deliciously creamy Green Matcha Tea made with almond or hemp milk. You can even relax with a Meowmosa! 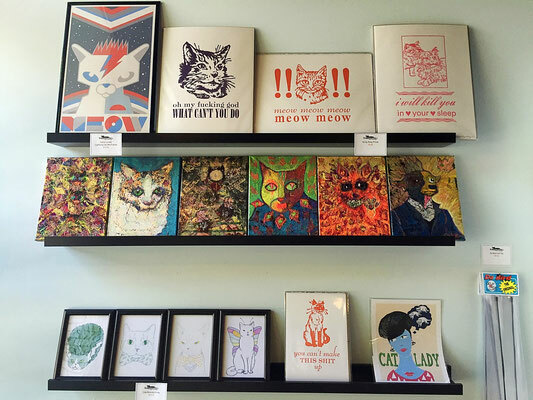 Purrington's also has a splendid assortment of cat-related artwork, cards, t-shirts and gifts that any cat or animal lover would appreciate. 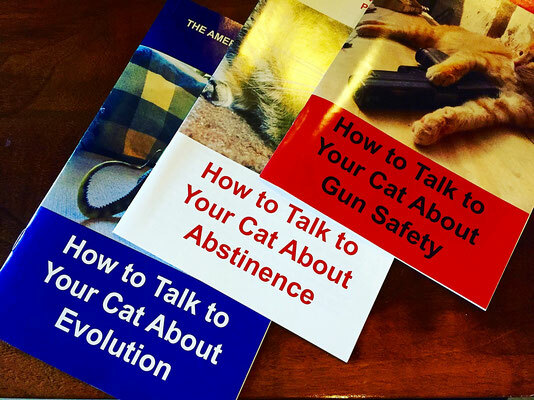 There are gifts for cats and people alike, like very cool and some very hilarious prints and booklets on such important topics like how to talk too your cat about evolution. You want to be properly informed for those kind of kittie talks, folks. Purrington's hosts many fun events for the local community. There are weekly yoga classes, a monthly movie night, a rapper that freestyles some cool kitty rhymes, reiki, and more. Check out the website for all the detailed happenings. 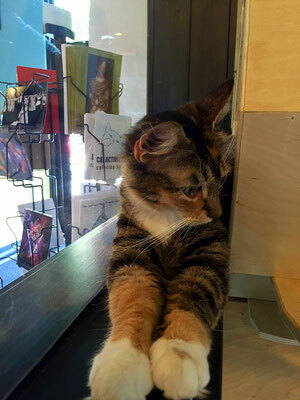 If you're in Portland, stop by Purrington's Cat Lounge at 3529 NE Martin Luther King. These sweet kitties would love to meet you and would love even more for you take them home to become part of your family! There's a who's-who picture book in the lounge that tells you a little more about the individual personalities of everyone that lives there. The lounge takes reservations and accepts a max of 15 people at a time, so best to book your spot online to plan your visit.